Parisian fashion consultant and digital influencer Chloé Harrouche is the enigmatic woman behind Loulou de Saison. She is a vision of the modern woman and has a sense of freedom that is evident in the way that she carries herself and her spirited sense of style. 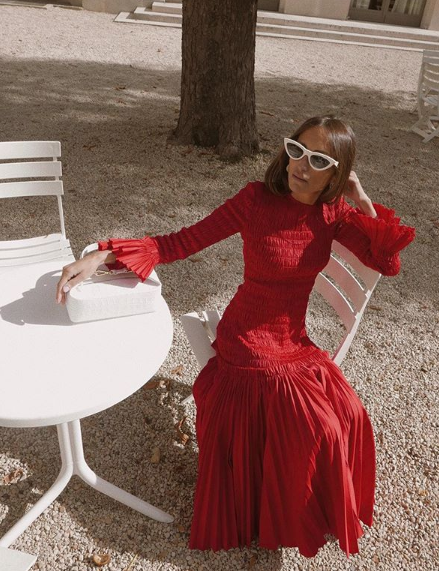 We catch up with the leading tastemaker to find out more about her personal style and French way of living. Happiness is the little moments of joy side by side! For example, listening to good music on a sunny morning with a cup of coffee and a big hug from my kids before school. In Paris…I was born in Paris and I am still living there. After being a consultant for many years I now work as digital influencer. My grandfather who is 94 years old, he gave me my values and taught me empathy. Honestly, integrity, working hard and family. A cashmere sweater, a pair of kitten heels and an oversized blazer. Incredible pieces from my Mother’s closet from the 80’s!! La promesse de l’aube de Boris Vian. I stay balanced thanks to my kids…. they are my alarm against my non-stop working life. I am a coffee addict;) I begin everyday with good music, short espresso and a croissant. I am lucky to travel a lot with my job and do so many things during the week. So on Sundays it is a luxury for me to sleep in with my kids, watch a good movie or go to the countryside and disconnect from Paris.